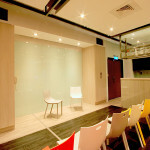 Feng Chia University ISTM iCE Design Lab – Scandinavian Design Consultant Co., Ltd. 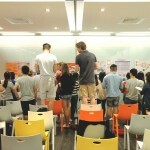 This project, for Feng Chia University in Taichung City, Taiwan was to create a vibrant environment for team-working and presentations for the interdisciplinary and multicultural classes of the iDEAS! 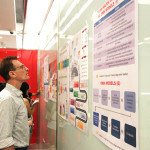 Project Programme at the newly-established International School of Technology and Management. 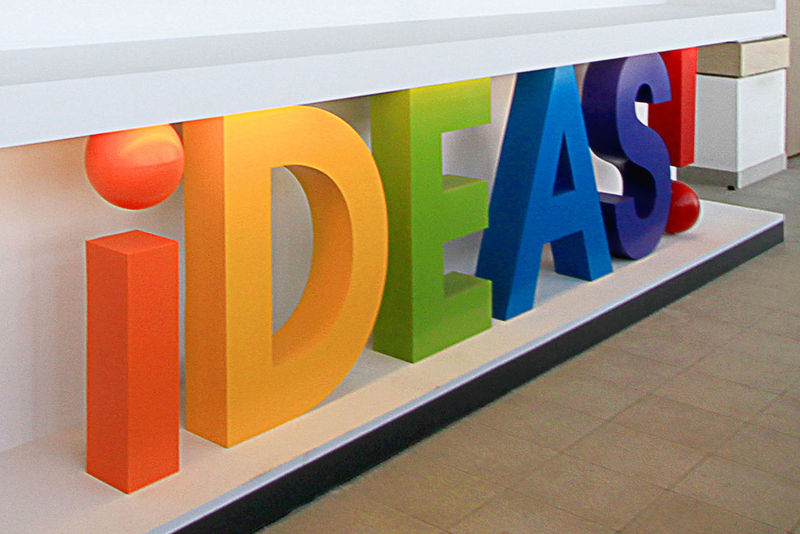 The iCE Design Lab is conceived as a dynamic space to encourage exchange for Innovation, Creation and Entrepreneurship by Design. 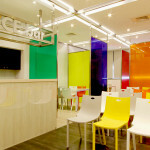 In what was previously an administrative office, we created a colourful, multipurpose space within a limited budget. After studying the proportions of the room, we divided the volume into 9 cubic modules outlined by the grid of the ceiling structure and dividing the floor into squares. 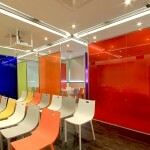 Glass walls are utilized to mark the vertical axis of the volumes, and to create both connection and partition between the spaces. 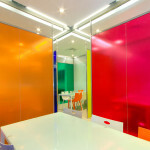 The four iCE-CUBES – each a cubic volume – are connected team-working spaces that are partitioned from each other and the central meeting SQUARE by bright-coloured glass walls. 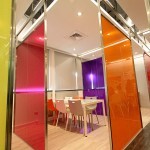 Each CUBE has a glass table with 6 chairs and glass walls for brainstorming sessions. 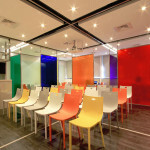 The SQUARE has 30 permanent chairs which can be supplemented with chairs from the CUBES and serves as a space for presentations, seminars, lectures and small conferences. 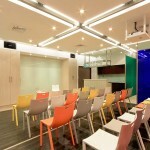 The chairs can be reoriented from the projector screen to the glass brain-storming walls for presentations. The SQUARE is served by the iCE-BAR which took advantage of the pre-existing kitchen to be able to provide light food and refreshments during events. The front glass of the bar can be opened so the panel can serve as a display area for event posters. 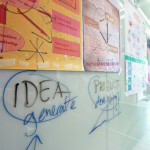 To open a “window” between the Lab to the University, we built a SHOWCASE outside the iCE Design Lab. 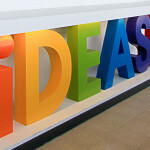 Supported by an illuminated 3D version of the “ideas!” logo we conceived and designed for the Lab’s learning program, it provides a platform where projects and information can be displayed. 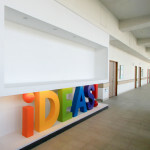 The two entrances to the Lab are illuminated by frosted acrylic cubes with the “iCE” Design Lab logo that we conceived and designed for the Lab.